This guide introduces some of the many features of the building and relates them to the community and Church of England Christian worship. Each of 8 sections looks at a stage in the journey through life where the church and the local community interact. Put the pointer on a section name at the top of the page to see the subject and click to see relevant descriptions and pictures. 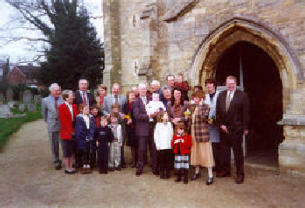 The present church building has been serving the local community in Sharnbrook since about 1250 and is on the site of an earlier church. Our church continues to play an active part in the lives of local people and we hope this guide will provide information and food for thought. The journey of life starts as we enter the world at birth and entry to membership of the Church is through baptism by water at the Font by the main South Door. 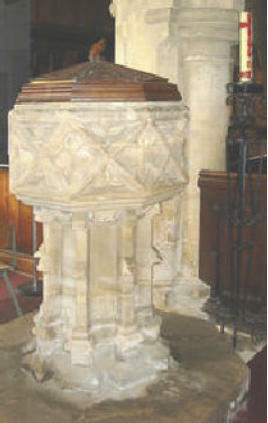 The Easter candle by the Font is the symbol of the light of Jesus in the world and is used to light a candle for the new member of the church during Baptism. Family, relations and other friends come to share in the Christening and Baptism of children, and adults. Further sections of ‘ Journey of Life’ are under development.